KeyForge is a card game for people who would love Magic: The Gathering, but who run screaming into Mommy’s arms upon hearing the words “deck building.” It’s a game for the most doe-eyed of card-game beginners and the most seasoned fans alike, in part because of its winning gimmick: There’s no booster packs, drafting, or deck building. Players purchase whole decks, each of which is completely unique. 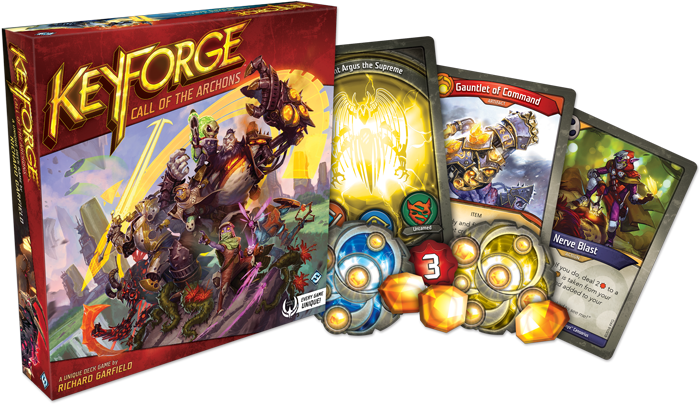 Released last week, KeyForge was designed by the patron saint of card games, Richard Garfield, who also masterminded Magic: The Gathering, Netrunner, and the Star Wars Trading Card Game. If you know the basics of any other modern card game—yes, even Hearthstone—KeyForge is very intuitive to pick up. One deck battles another deck. Each card is part of a “house,” represented by a colorful symbol. Each house has different qualities, like being good at stealing (Shadows) or being good at protecting weaker creatures (Sanctum). Each deck is composed of cards from exactly three houses, all mixed together. Pretty simple so far. 1. No mana system. While most other games have a “mana” system that lets players play cards at a cost, KeyForge dispenses with this. Instead, players can only play, attack with, “reap” points from, or activate cards from one house per turn. 2. Layout matters. You need to carefully consider not only which house to play, but where on the table you place them. Cards on a flank or next to another card will receive certain buffs or detriments depending on where they are on the board. 3. Win conditions. To win, a player must collect enough “ember,” but that’s not quite enough. “Ember” are points that can be created, stolen, or “reaped” by turning a card sideways. When a player has six ember at the beginning of the turn, they can “forge” a key. The first to get three keys wins. Most card games have themes, or premises, that help carry along some superficial lore. KeyForge does, but it’s really just nonsense. “In the center of the universe hangs the Crucible, an artificial world built from the pieces of countless planets,” reads the KeyForge website. Because the Crucible contains the vestiges of all these planets, it’s swirling with the stuff of seven totally discrete Houses. There are Martians. There are also knights and giants. Its aesthetic is totally incoherent, but doesn’t at all detract from the fun of the game. That incoherence does detract from the card game when the different houses fail to intuitively synergize with each other in a given deck, which in my limited experience, is pretty often. I’ve had several games where I’ve forged a way toward victory with just one house, while pulling in a few creatures or actions from a second house as necessary, and finally find myself with only cards of the third—and least useful—house in my hand. That can feel frustrating when you’re on the brink of success. Thankfully, in KeyForge, you’ll be flushing out your hand a lot. It’s usually beneficial to play a lot of cards at once in KeyForge, and after each turn, a player’s hand refills to six cards. That means you’re cycling through cards pretty quickly. I’m not much of a chess player, so I’m really enjoying how KeyForge only asks me to think one or two turns ahead instead of, say, five. It’s more about tactics than strategy. Keyforge seems to be off to a strong start. Two hobby shops in New York that I checked were nearly sold out of KeyForge packs early last weekend. That’s because the packs are the draw. After players pick up a starter set—which includes tokens, two player decks, and two starter decks (the game’s only standardized decks)—they’re going to want to collect more decks. KeyForge’s decks are excitingly random and idiosyncratic. Each has its own winning strategies and pitfalls, that, at least in my experience, makes them feel just mystifying enough to feel risky, but also just fathomable enough to inspire rewarding strategies. Surely the more someone plays the game, the more they’ll get an gut sense for opponents’ potential game plans. Knowing that a player could have one card from a house they’re using can mean playing defensively in anticipation of that. It’s just a little harder to play reactively because there’s always going to be some X factor. In that way, the same thing that makes KeyForge so appealing to new card game enthusiasts—its unique decks—is what makes it deep enough to entertain veteran Magic: The Gathering players. 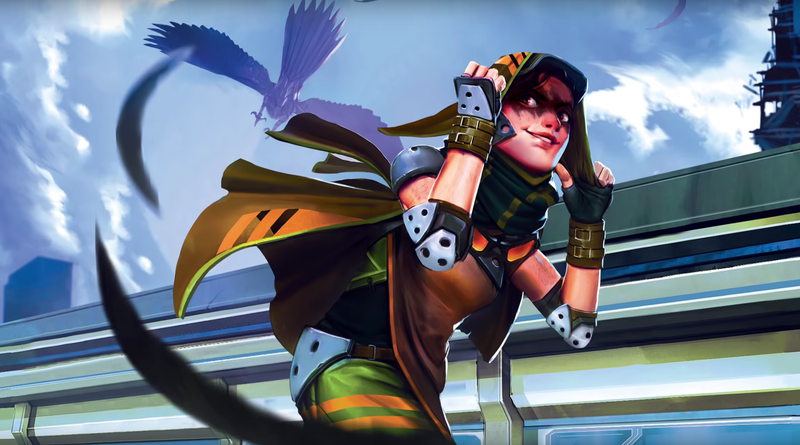 Right now, KeyForge is the hot new thing in card games because it’s so delightfully easy to pick up and play, but also, asks players to be very, very resourceful and quick-witted. When there are so many different options for entertainment—and many of them are 100-hour video games—I find myself less excited to go through the motions of deck building than I am to just get going and play a game.